Displays input/output amplitude graphs of audio processors. Is there a better alternative to Audiospex? Is Audiospex really the best app in Audio category? Will Audiospex work good on macOS 10.13.4? 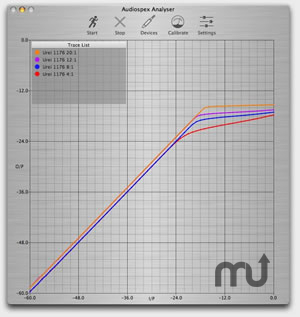 Audiospex is a free audio dynamics analyser application designed to accurately display an input:output amplitude graph of any dynamics processor - compressors, limiters, expanders or gates. It can be used to confirm operation, align stereo devices or analyse the 'knee' of non-linear devices such as soft knee compressors or optical devices. Audiospex needs a review. Be the first to review this app and get the discussion started! Audiospex needs a rating. Be the first to rate this app and get the discussion started!